Razor bumps, also known as ingrown hairs, are a common skin condition caused by shaving the skin of the face and/or body. 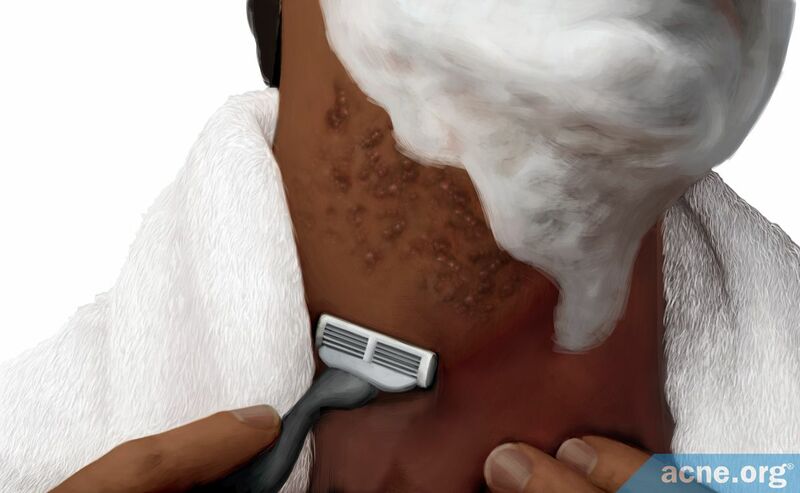 Razor bumps occur when shaved hairs get trapped inside the skin, causing lesions that resemble acne. They are more common in people with curly hair, especially black males, and can be prevented by no longer shaving or changing hair removal practices. Razor bumps may also be treated with a skincare regimen. Who Is Most Likely to Develop Razor Bumps? How Do Razor Bumps Develop? Razor bumps or "shave bumps" are a common skin condition that develops as a result of shaving and are a type of ingrown hair. While ingrown hairs can result from many hair removal practices, such as waxing, plucking, or threading, razor bumps are ingrown hairs caused specifically by shaving. The medical term for razor bumps and other types of ingrown hairs is pseudofolliculitis barbae. 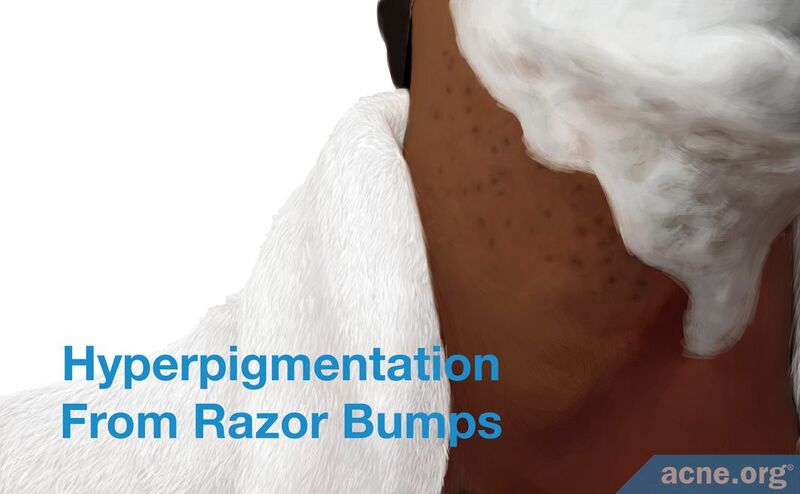 Razor bumps result in firm, skin-colored or red or dark lesions that look like acne and can be itchy or sore. 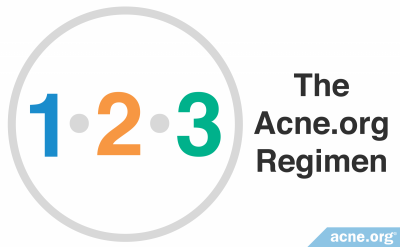 Sometimes, liquid that resembles pus in a pus-filled acne lesion can accumulate in these lesions.1 Although these breakouts appear similar to acne, they should not be mistaken for it. Although anyone can develop a razor bump occasionally, razor bumps are most common in people whose hair curls tightly. Since people of African descent typically have curly hair, they are more prone to developing razor bumps than people of European descent. Because of this, black males who shave facial hair are much more likely to develop razor bumps than white men who shave facial hair. As Drs. 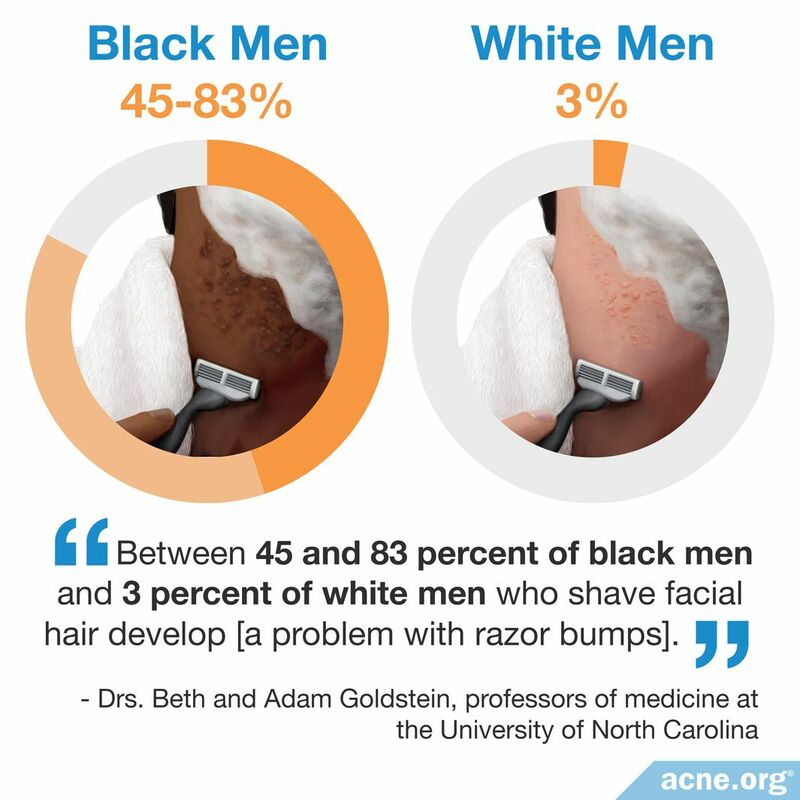 Beth and Adam Goldstein--both professors of medicine at the University of North Carolina--wrote on a website for doctors called UpToDate, "Between 45 and 83 percent of black men and 3 percent of white men who shave facial hair develop [a problem with razor bumps]. "1 Most people, regardless of ethnicity, will develop a razor bump once in a while. This includes women who shave parts of their bodies. Razor bumps most often appear on the neck. However, any area of the body where a person shaves hair, such as the legs, armpits, or pubic region, can develop razor bumps. When a hair is shaved off, it soon begins to regrow. As the hair regrows, it may become trapped in the skin, developing into an ingrown hair. When this occurs, the body sees its own hair as an "intruder" and attacks it with an inflammatory response. An inflammatory response is the body's reaction to any foreign object or anything that happens to be in a place on the body where it is not normally supposed to be. As a result, the body tries to fight off the "intruder" by attacking it with inflammatory cells and substances. This defensive reaction causes the typical signs of inflammation, such as redness, swelling, heat, and soreness. The same reaction occurs when you harm the skin with a wooden splinter and do not remove it immediately: after a while, the skin displays characteristics of inflammation mentioned above. In the case of ingrown hairs, the regrowing hair itself becomes the "intruder," and the resulting inflammation leads to what we call a "razor bump." Normally, hair grows from a hair follicle (sac) and emerges through a pore in the skin. However, when a shaved hair regrows, it can pierce the skin inside the pore. This can occur in one of two ways. In extrafollicular penetration, the hair emerges from the skin pore, but then curls back on itself and re-enters the skin near the follicle. In other words, a loop of hair is formed above the skin. This is especially likely to occur when the hair is curly, short, and has a sharp end due to shaving. As the hair continues to grow, it eventually finds its way out of the skin again, but this takes several weeks. In transfollicular penetration, instead of emerging from the skin pore, the hair pierces the wall of the hair follicle and grows into the surrounding skin. The hair may continue to grow several millimeters through the dermis, the middle layer of skin, before finding its way out of the skin again, which typically takes three to six weeks. Just like in extrafollicular penetration, transfollicular penetration is more likely to occur if the hair is curly and has a sharp end. Transfollicular penetration can also result from stretching the skin when shaving. When a person stretches an area of skin, passes over it with a razor, and then releases the skin, the cut hairs shrink back into their follicles. This results in short, sharp-ended hairs just under the skin surface, and these hairs are especially likely to become trapped when they start to regrow. People with tightly curled hair, such as people of African descent, are particularly likely to develop razor bumps for two reasons. Management of razor bumps should be heavily focused on prevention, rather than treatment. Additionally, some topical medications are available to treat razor bumps. There are three approaches to preventing razor bumps. 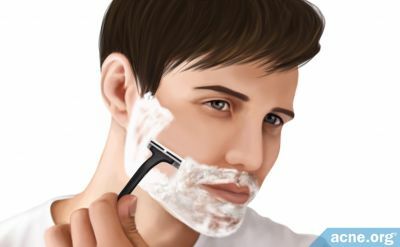 Alternatively, razor blades can be replaced by electric clippers that leave the hair at least 5mm long so that the hair does not curl back and pierce the skin. The problem of recurring razor bumps can be solved by long-term hair reduction, which destroys the hair follicles and can be accomplished by laser hair removal. Of course, the downside is that you can no longer grow hair in that area--for example, a man who undergoes long-term reduction of facial hair will no longer be able to grow a beard. Goldstein, B. & Goldstein, A. Pseudofolliculitis barbae. (2017). <https://www.uptodate.com/contents/pseudofolliculitis-barbae>. Oakley, A. Folliculitis barbae and pseudofolliculitis barbae, <https://www.dermnetnz.org/topics/folliculitis-barbae/> (2016). 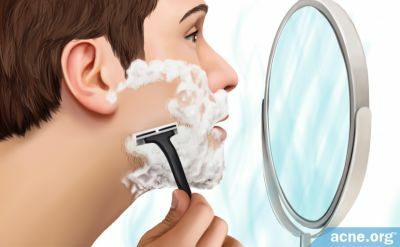 Is Shaving Good or Bad for Acne?